Once upon a time there was a city. There was once and there is not now. It seems to exists now, but it is not. It is not only the Place. Because every Place means the People. People come and go, grow up, evolve, leave the town. Build another towns in another places and another worlds. Memories remaining – pictures in our heads, the feelings, the snapshots… small pieces of reality, the good ones. Memories of friends and enemies, people who built the city, love each other, hate each other. People who was born, who died. People who met and broke up, people who married, moved out and started family. Both there and here. We can keep the old precious photos, we can even keep the old virtual places. Not only in memories. Personally. First-pixel-hand. Put ourselves in old virtual shoes. That is why replica of Bohemia city was built. Imprint of the past in the environment of present times. You cannot meet the same avatars and the people behind them, cannot hear the same sound and cannot see the same pixels. 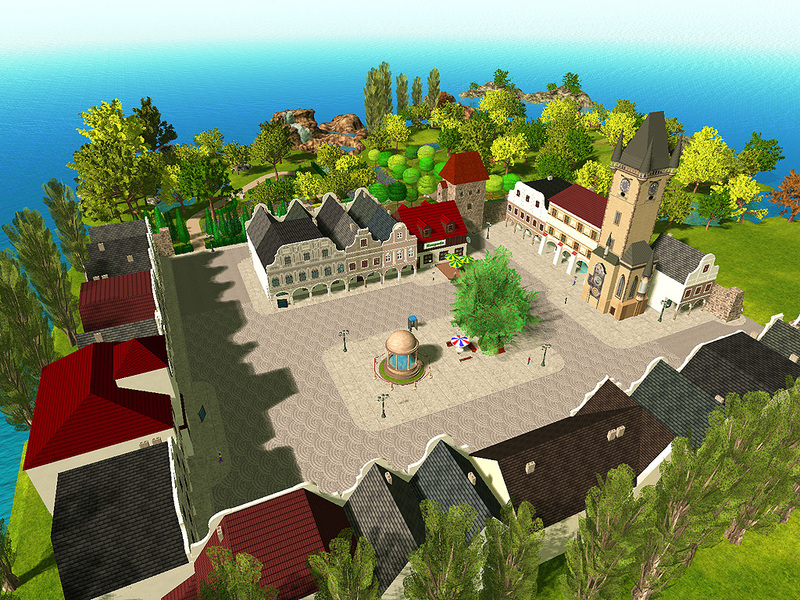 Bohemia city was a place in Second Life, built in 2007. There was a first community place for Czech and Slovak people, it was participating in Sister Cities project – newcomers friendly place with plenty of how-tos, educational and entertaining events in czech and slovak languages. It was sold to another bunch of people in 2011 and rebuilt to different place. I have been one of the creators of the original “old” Bohemia city. There is a replica of main square of Bohemia, inspired of several versions of central town square in years 2007-2010. This is not copy, legal nor illegal, of anything from Second Life. For first-look it seems to be same, but it is only similar. There are plenty of mesh object, so use mesh-capable Viewer. I made my photos in Singularity. 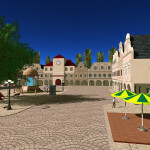 There are photogalleries with about 100 snapshots – history of building Bohemia in SL and living there, and the building my replica in OpenSim at 2013. There are freebie items – 12 mesh trees from surrounding park, and mesh pub table and chair with basic Opensim sit animation. Region has Vivox Voice enabled. Author of every items in region is me, Zuza Ritt. There is no copy, legal nor illegal, of any object or textures from Second Life. Only exclude is ancient gate tower – this is copy (prims only, not textures) of the same tower from Second Life, where it was built by me. So this is prim copy of my own creation. Author of all the textures in region is me, Zuza Ritt, or there are used textures available online for free legal use. Unless stated otherwise, author of all 3D object is me, Zuza Ritt. There are several mesh objects from free 3D database, all these object have the notice in description. Freebies items are available for free use, they are copy and modify.